Today we went to Lost Maples – named after the Big Tooth maples which grow there and hopefully a good place to see the Texas endemic Golden-cheeked Warbler. 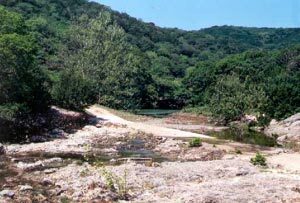 Lost Maples is a valleyed area with heavily-wooded hillsides and rivers running through the valleys. As we drove in we had two Chipping Sparrows on the road. We parked in a carpark at 1800 feet elevation and took the East Trail towards the ponds. This trail follows Can Creek. Along the way we got Ash-throated Flycatcher, Common Raven, Inca Dove, Eastern Wood-pewee, Ruby-crowned Kinglet, Blue-gray Gnatcatcher and heard Golden-cheeked Warblers. None seen though! Tanagers, Northern Cardinal, Red-tailed Hawk and Rufous-crowned Sparrow. Another singing Golden-cheeked Warbler was heard, this time seemingly a lot closer. After some searching David tracked it down and we all had good 'scope views of this fine and much-wanted bird. A little way further down the track another male was found, more distant across the river this time, but showing well. As this bird was being watched we also came across an Acadian Flycatcher and a pair of nesting Yellow-throated Vireos. When we reached the ponds we stopped for a search of the area. A singing Canyon Wren was soon found. although singing from a bush rather than the expected rock face. This was followed by Eastern Phoebes, nesting in holes in the cliff face. Everyone was watching the phoebes execpt me who was a little way away looking in the opposite direction. A bird flew down onto the path in front of me and as I looked at it Townsend's Solitaire came instantly to mind! Not very likely this far east (they winter in west Texas). I shouted at the others to get over here and all rushed over – of course, the bird flew off. My identification was, to be honest, not believed. Fortunately the bird was relocated and confirmed as a Townsend's Solitaire. I was very happy. As we watched this area we also had a female Spotted Towhee and a Red-eyed Vireo. Carrying on along the path we came across a pool used by some birds as a drinking pool. The birds flew from a pathside bush down to the water and back. Here we had Orange-crowned Warbler, Nashville Warbler and Wilson's Warbler whilst Red-shouldered Hawks flew and called overhead. On the walk back we saw three Western Scrub-jays, a Black-and-white Warbler and a Cooper's Hawk. After returning to the lodges and a quick sleep we headed to the famous Frio Bat Cave. On the way we stopped when Vaughan saw a 'bunting' fly down from a wire. I appeared suddenly in a bush, face on, and then disappeared. I looked at Vaughan and said 'it's a Lazuli Bunting'. I had no idea this was extremely unlikely this far east – then again we had just seen a Townsend's Solitaire and Lazuli Buntings migrate through west Texas. Eastern Bluebirds are seen in this area but this bird had a clear blue throat and upper breast, and a band of orange above a band of white. We carried on to the bat cave area. A quick stop to see if anything was about yielded poor views of a Zone-tailed Hawk for a few of us. Just below the bat cave (which is on top of a small ridge) we did a walk about. Vaughan found a Canyon Towhee followed by two Black-throated Sparrows and a pair of Black-tailed Gnatcatchers and two young. We also heard and saw singing Rufous-crowned Sparrow. A flock of about 400 Cave Swallows flew around over the ridge. Whilst waiting for some bat cave activity a Great Horned Owl was reported. We rushed to the scene and found the bird sitting on a slope in the open. As we watched this a Canyon Wren appeared and sang from a wrecked jeep and then two Rock Wrens arrived and eventually came very close. Finally the bats started coming out of the cave and streaming off over the Texas countryside. There were three or four Red-tailed Hawks diving into the bat groups and taking easy dinners. We watched the bats come out for well over an hour and they just kept on coming. It was impressive to see long streams of bats against a thunderhead cloud full of lightning.